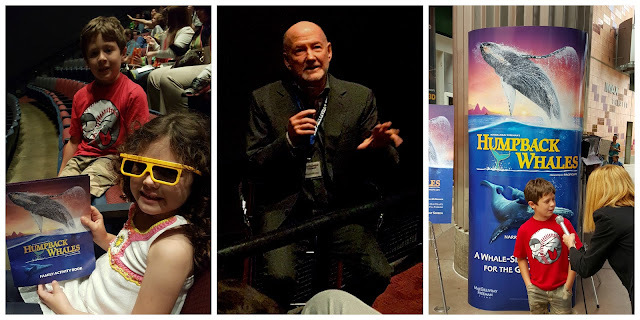 Last week I got the chance to teach my children in a new way, exploring our oceans in the new IMAX movie, Humpback Whales in 3D. This new documentary is playing at the IMAX at the California Science Center. We enjoyed a few activities learning about the migration, flukes and blubber of the Humpback whales. We were also given a fun educational activity guide which you can find here for free. My children had never been to an IMAX movie and this was amazing! The quality of the videography of these majestic animals was enhanced by the fact it was on such a large screen! We felt like we were swimming with them. 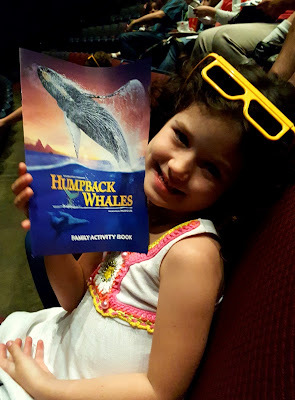 The journey of the Humpback Whales 3D took us to Alaska, Hawaii and the remote islands of Tonga and for an up-close look at how the whales communicate, sing, feed, play and take care of their young. Humpback whales were on the brink of extinction until researchers discovered that the hauntingly beautiful songs that they sung were communications by highly intelligent beings. The documentary brought us along with the researchers to unlock the mysteries of these 50-foot 48 ton animals who leap out of the water in acrobatic displays. Did you know that they migrate more than 6000 miles round trip every year? Did I mention that Ewan McGregor's soothing accented voice makes it very easy on the ears to follow and learn from? After the movie, the director was on hand to take questions from the "kid reviewers" in the audience. Children were invited to learn more about the plight of the Humpback Whales and were invited to learn more directly from the "whales" mouth. My son was called on to ask a few questions and was even interviewed by the media afterwards. 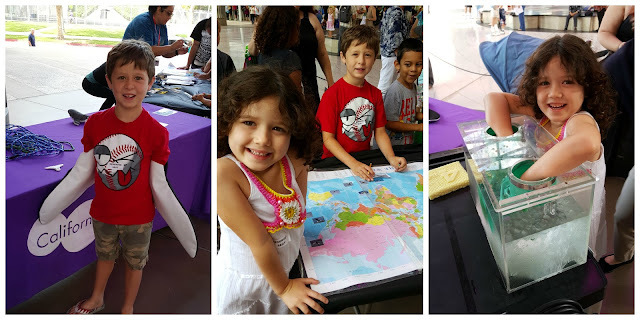 I love seeing my kids engaging in experiences where they can learn hands on and they can't wait to go back to see more movies! Humpback Whales 3D is now playing at the California Science Center. To check show times, please visit them at http://californiasciencecenter.org/imax/imax-schedule. Admission: Starting at $5 (online only) There are discounts for online ordering and for multiple movies. Open Daily:10:00 a.m. - 5:00 p.m.
General admission is free! There is a $2 fee for the Space Shuttle Endeavor however. I would love to see this movie, I've always been fascinated by whales.